Melissa Neiderman’s tireless charitable efforts earn her the 2017 Women’s Leadership Forum’s Inspiration Award. Melissa Neiderman attributes the mentorship of Harold Matzner (center) with helping her philanthropic efforts, like this one for cancer patient Desi Chechin with Charissa Farley (left). Melissa Neiderman recalls watching the Jerry Lewis Telethon for the Muscular Distrophy Association as a child, thinking even then that she wanted to give back. Neiderman grew up in the Catskills, a small upstate New York community that has, historically, been known as a destination for entertainers. It was in her hometown by chance that she was able to meet Lewis, who she says is one of her earliest philanthropic inspirations. Neiderman moved to the Coachella Valley to join her parents where throughout the years she has been involved in fundraisers on behalf of the homeless, American Heart Association, ACT for MS Christmas Tree Lane Committee, and Loving All Animals. As a teacher at Palm Valley School in Rancho Mirage, she helped establish an annual walk-a-thon to benefit local charities and inspire children to give within their community. Neiderman says her commitment has remain unwavered thanks, in part, to the mentorship and encouragement of Harold Matzner, whose efforts have set the tone for the valley’s philanthropic endeavors. 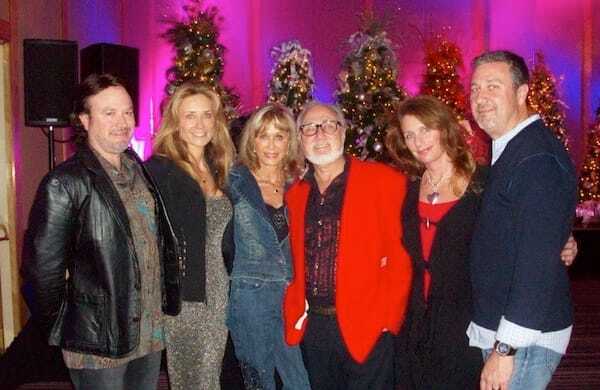 Joining Melissa Neiderman (second from left) at the 2016 ACT for MS Christmas Tree fundraiser included (from left) her husband, Tim Gross, who plays guitar in Rick Springfield’s band; her mom, Diana; her father Andrew, a highly successful author; sister-in-law Shannon Neiderman; and her brother, Erik. After 21 years of teaching, Neiderman retired and has focused on championing causes near and dear to her own heart. Influenced by her mother’s experience as a two-time cancer survivor, she has worked on behalf of the American Cancer Society in Palm Desert (serving as event chair, advisory chair, Leadership Council member, and community engagement volunteer). She took a particular interest to fundraise for Desi Chechin, a young desert native who lost her life to Stage 4 neuroblastoma. Neiderman has since founded and now serves on the Board of the Desi Strong Foundation with a dream to find a cure for children’s cancers. Her contributions have not gone unnoticed. Neiderman will receive the Inspiration Award by the Women’s Leadership Forum of the Coachella Valley at its Fifth Annual, “Women Who Rule,” Awards Luncheon and Scholarship Fundraiser. The event, presented by Desert Regional Medical Center, will be held Feb. 3 at Agua Caliente Resort & Spa in Rancho Mirage. Melissa Neiderman (right) with mom Laura Palada and her 6-year-old daughter, Desi Chechin, who died from cancer.